What could possibly make a bigger splash at mealtime than the Sea Tails 3-Piece Baby Set from Reed & Barton. This easy care stainless steel baby flatware set includes a "fish" fork, "seahorse" spoon and "whale" infant feeding spoon. These are the perfect dining companions for every little "buoy and gill." Part of the SeaTails Collection. The Sea Tails three piece feeding set is a great gift for a baby shower or first birthday. Give this feeding set with the Sea Tails stainless steel baby cup or two piece feeding set for a complete mealtime presentation. The whale spoon measures 5-1/2 inches long. 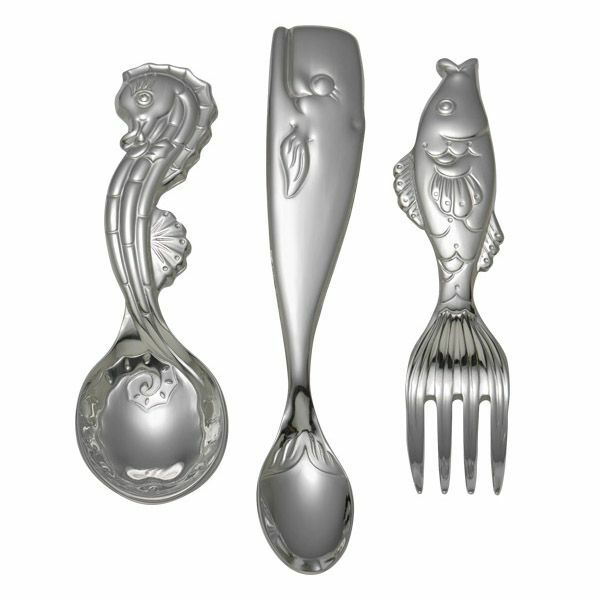 The seahorse spoon and fish fork measure 4-1/2 inches long each. This feeding set comes gift boxed. These items are not able to be engraved. This item has been discontinued by the manufacturer and we have no stock remaining.